In honor of Hospital Week, I wanted to shed some light on the amazing people that make up our hospital and outpatient clinics. National Hospital Week is an opportunity to promote our hospital’s support of community health and celebrate the dedicated men and women who make it all happen! Brenda McLamb came to Bladen County Hospital in 1984 as a Part Time Respiratory Therapist. She worked on the weekends while she was in school. When she finished school, she joined as a Full Time Staff Respiratory Therapist. She held that position until 1986 when she was promoted to Director of Cardiopulmonary. Brenda’s department is responsible for breathing treatments, EKG’s and Stress Tests. Brenda is also responsible for leading the “Code Team”, which means if a patient’s condition declines to the point of needing CPR, this is the team that responds. Brenda has also led the Activities Committee for numerous years and is known for her smile and laughter. She brings joy to any situation and is always eager to lend a helping hand. Brenda and her husband Jerry live in Salemburg, NC. She has two daughters, Kerry Ann Kinlaw who is married to Bradley Kinlaw and Amanda Carroll, who is married to Justin Carroll. 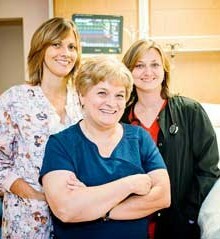 Both daughters are nurses and Amanda is employed with Bladen Healthcare as well. Brenda also has 4 grandchildren who she will gladly tell you all about if you ask. Brenda’s favorite past time is making “Memory Bears” which she sells on her Facebook page sewsweetmemories. We thank Brenda for her 30+ years of service and all that she has done for our community.